When I first leaped into the online business world, I didn't know anyone who looked like me. The most popular bloggers were often blonde haired, blue eyed babes who strutted around in their latest Liliy Pulitzer dresses. Pure, southern gems who looked to everything Pumpkin Spice with the perfect Pinterest worthy lives. While I admired the brand and the audience that they were able to build, their world and perspective on life was very different from my own. I still couldn't help but to want to connect with a female business owner who looked like me. I come from a family of hard working black women, so it wasn't that I didn't have that representation around me. What I lacked was seeing a true boss with thick curly hair, full lips and brown skin like mine that I could relate to. Someone I could watch build their business from the ground up who kept it real and had no shame in being a woman of color. Representation matters, no matter how old you are. Luckily, throughout the years of navigating through the internet, I have not only discovered tons of powerful women of color who are working hard to change the world and build their own empires, but I have also gained a community of friends who look like me and understand what it's like to run a business as a woman of color. The next Oprah's of the world. The fearless women who were not intimated with walking into a boardroom filled with older white men to ask for money. Even with this community, getting all of us into one room that was specifically curated for us has been hard. That was until 21Ninety announced their Summit21 Conference in Atlanta. 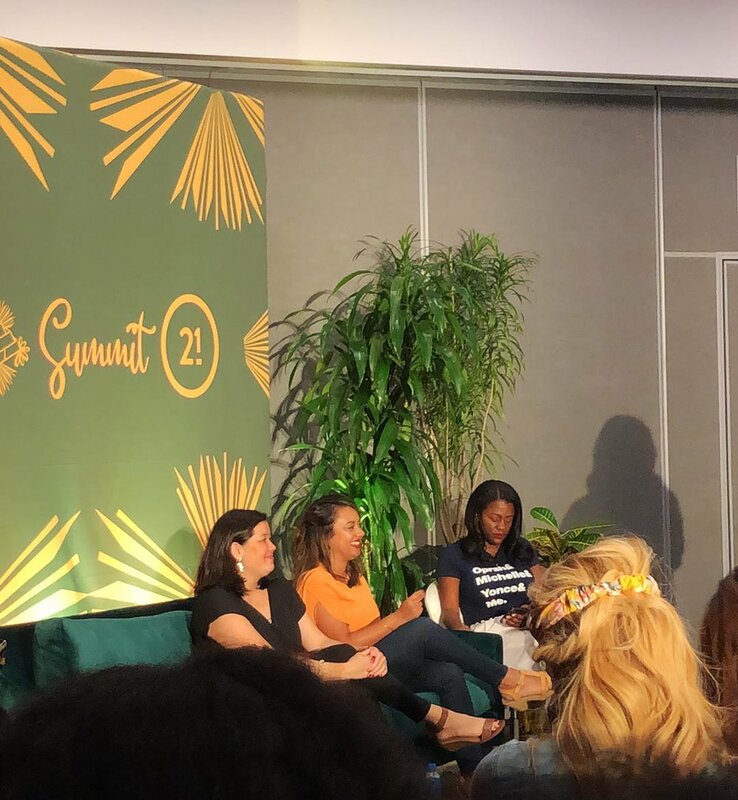 If you're unfamiliar, 21Ninety is a lifestyle brand for women of color to learn, discover, grow and connect as a community as is founded by Morgan Debaun, CEO of Blavity. As soon as they announced the dates of the conference, I knew for a fact that I would be going. Not only would it help me to step out of my comfort zone, but it would also allow me to connect in person with other black women who were crushing it in their industries. I craved that energy, that community and that electric feeling I believe only happens when so many magical black women are in one place. This past weekend I headed down to Atlanta and immersed myself in keynotes, masterclasses and fellowship with over 1200 women of color. I walked into the weekend with an open mind, and the expectation of leaving with a bigger sense of purpose. Let me just say, the conference did not disappoint. Over two days, I was able to listen to some of my favorite women like Myleik Teele founder of CurlBox, Tiphany "The Budgetnista" Aliche and the founders of Shine Text, share their stories and keys to success. To being inspired and getting a good word from women like Sarah Jakes Roberts and Angela Rye. Morgan and the 21Ninety team spared no detail and really brought out the heavy hitters for the event. I learned all about setting up my own home studio from Maya Washington, to digging into strategic branding with Stephanie Scott, CEO of First & Last PR to learning more about what it's like to secure venture funding as a woman of color. Downstairs from the fireside chats and masterclasses, the team put together Chateau21 where attendees were able to fill their bags up with free products, there was a book store/art gallery filled with books and art from other women of color and the brands who sponsored the event put together beautiful installations where you could learn more about what they do and also pick up a few free samples. Morgan also had her own booth where she introduced her new skin care line, M.Roze Essentials to the world. From the storytelling, the incredible energy that you felt in each room to being able to hug and chat with women that I have been connecting with online for years, the entire weekend was one to remember. I met new women, crafted new business ideas with a friend and left Atlanta full and ready to get to work. To Morgan and the entire Blavity and 21Ninety crew, Thank you! Thank you for creating this space for us and thank you for showing women that we can build incredible businesses around a need and the things we love. Thank you for proving that over 1200 black women can get together in one room without there being drama and that we don't have to fall into the stereotypes that the world has created for us. Although I am on the cusp of turning 30, this weekend truly proved just how much representation matters. I was inspired, filled with more confidence that I have ever felt before and left with a bigger sense of how I want to use this brand and everything that I do to positively change the lives of women around the world, especially those who look like me. I was honestly so focused on being present in the moment that I completely failed to take great photos, but if you're interested in seeing behind the scenes and clips from some of the classes, head over to our Instagram account. I've a ton of photos and clips in our "events" highlight. Every Sunday we send out one tip/quote, one article and one interview designed to help you have the best week ever! No more dreading Mondays with this weekly newsletter hitting your inbox!